Do you need a bigger file? The file available on this site is 634 x 1024 px. To obtain an alternate file type or higher resolution copy, please contact the owning institution. 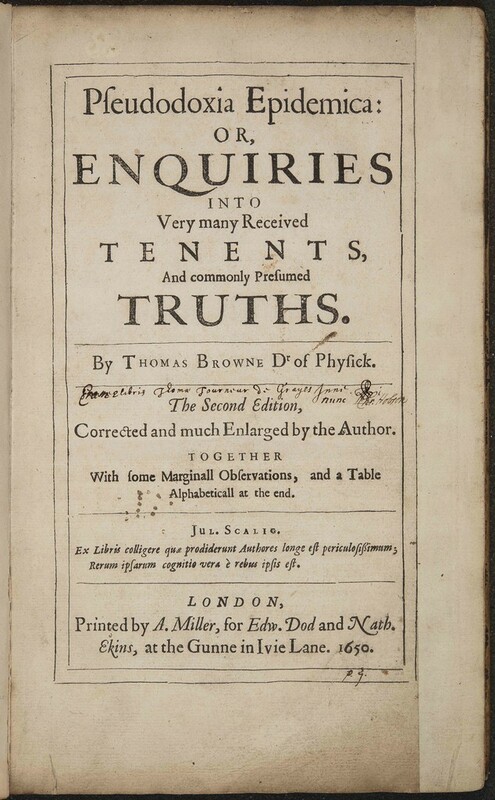 Scope/Content: Extensive contemporary underscoring and annotations in the hand of Thomas Tourneur throughout a 1650 edition of Sir Thomas Browne's Pseudodoxia epidemica. Annotations provide internal cross-references to other passages in the printed book and external cross-references to other books and authors, including Browne's own Religio Medici as well as titles by Francis Bacon, George Sandys, Thomas Ridgley, Raphael Holinshed, Johann Heinrich Alsted, Albertus Magnus, and Christoph Scheibler. Tourneur also adds new entries to the printed index in manuscript. Tourneur's annotations occasionally comment on the printed text and index key terms. Scope/Content: "Sum E libris Thomas Tourneur de Grayes Inn" inscribed on title page; A later owner has amended the inscription to "Eram E libris Thomas Tourneur de Grayes Inn nunc Chr. Hobson."